ANS Performance Diablo Inferno is a highly advanced fat burner containing many active substances, including anhydrous form of caffeine, higenamine hydrochloride, choline bitartrate, hordenine hydrochloride, theacrine (TeaCrine®), L-carnitine tartrate and extracts from Evodia rutaecarpa, green bean, Hemerocallis fulva (AdiLase ™) flower, Alchemilla vulgaris (eLMn8 ™) leaves, olive leaves and Aframomum melegueta seeds. Having a beautiful and sculpted silhouette is the most common reason for implementing fat burners as a tool to facilitate weight loss among physically active people or passionates of silhouette sports. However, the users should not forget about health aspects. Pharmacotherapy and supplementation are one of the five methods of treating obesity in addition to proper diet, psychotherapy, physical activity, and surgery. Considering obesity, even a small reduction in body weight reduces the risk of diabetes, some types of cancer and cardiovascular diseases. .The addition of caffeine in slimming preparations results in increased release of adrenaline, which stimulates the central nervous system and activates lipases, thereby mobilizing fat burning. In combination with another component of the preparation – Hemerocallis fulva flower extract – it supports lipolytic sensitivity and fat tissue metabolism, facilitating effective slimming. Higenamine HCl is an agent that increases noradrenaline levels, and when added to slimming preparations, it boosts energy and sharpens the concentration. Studies have shown that supplementation of choline bitartrate in combination with caffeine and carnitine reduces serum fat concentration in rats and increases the use of fat as a source of energy. Choline plays a role in the oxidation of fatty acids and their transport from the liver to the mitochondria of skeletal muscle cells and other metabolically active tissues. Hordenine HCl stimulates the central nervous system, supports the use of fat for energy purposes, slows down the digestive process and participates in the alleviation of the effects of weight loss. The Evodia rutaecarpa extract contained in the preparation has been standardized to a high content of 98% of evodiamine, which, like capsaicin, increases heat production in the body by increasing burning of calories and fat. Evodiamine also increases the release of catecholamines, such as adrenaline and dopamine, helping to control appetite and raising energy levels. The green bean extract contained in the product was standardized to 50% of chlorogenic acid. Chlorogenic acid has been shown to inhibit the enzyme (glucose-6-phosphatase) involved in the release of glucose for energy purposes. Consequently, the body is forced to use alternative energy sources, such as fats, which in the end results in safe and effective weight loss with no harm to muscle glycogen. Hemerocallis fulva flower extract (AdiLase ™) has properties that support fat loss. Studies show that in the presence of norepinephrine, it increases the number of cAMP molecules that, by stimulating protein kinase, transforms inactive, hormone-sensitive, triacylglycerol lipase into its active form. Triacylglycerols are stored mainly in fat cells of subcutaneous and visceral fat deposits. It has also been proven that this effect is enhanced in combination with caffeine, which is also a component of this preparation. Alchemilla vulgaris leaf extract (eLMn8 ™) is a source of tannins that have proven thermogenesis-enhancing properties of the body and flavonoids, which reduce the absorption of fats, reduce the expression of genes that regulate lipid metabolism, increase energy expenditure and reduce gaining weight and fat mass. Theacrine is characterized by a caffeine-like stimulating effect that provides a long-lasting boost of energy. In addition, it improves mood, increases motivation and mental acuity. L-carnitine participates in the transport of fatty acids to the mitochondria, where they can be used for energy needs. Carnitine supplementation may support the process of fat burning and increase the level of energy thus improving physical performance. Olive leaves extract (Olea europaea) contained in the preparation has been standardized to 20% oleuropein. Recent research suggests that oleuropein increases the release of noradrenaline and adrenaline, and also increases thermogenesis in brown adipose tissue. In addition, it is believed that oleuropein increases the transformation of the thyroid hormone T4 (thyroxine) into the stronger form T3, which is much more active in increasing the basal metabolism. Aframomum melegueta seed extract contains a 6-paradol. The results of clinical trials provide evidence that the compound can significantly increase energy expenditure and loss of brown adipose tissue. 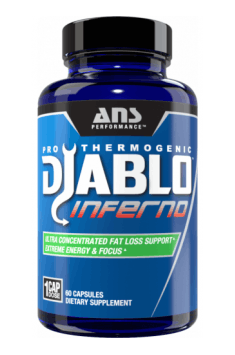 In summary, ANS Performance Diablo Inferno is an effective fat burner that promotes fat metabolism and lipolytic sensitivity. In addition to the slimming effect, the preparation stimulates the nervous system enabling performance of activities and increasing physical activity during difficult periods of reduced energy supply. Take 2 capsules a day, one in the morning and the other in the afternoon. To assess the tolerance to supplement, should start with 1 capsule in the morning for the first 2-3 days. If no adverse reactions occur, the dose may be increased to 1 capsule in the morning and 1 capsule in the afternoon. We do not recommend exceeding the dose of 1 capsule per serving and 2 capsules within 24 hours. For best results, the preparation should be supplemented in combination with a proper diet and training. To avoid insomnia and over-stimulation late in the evening, do not take the preparation within 5 hours before bedtime. As sportsmen and athletes, we understand the competitive character of the sport, the need of being successful and winning. This passion gives us the energy and inspires us every day to create the innovative supplements of the highest quality and effectiveness. All our products are tested on humans, not on mice. This is the part of our mantra, which we proclaim in everything, what we do: innovation, quality, true science and values. Our motto is: True science, true results. Cellulose (capsule), vegetable magnesium stearate, silicon dioxide, titanium dioxide. Capsules containing HMB. They increase strength and endurance and help regeneration processes. Formulation containing HMB and L-arginine. It provides greater strength and has muscle pump effect. Higenamine affects the production of nitric acid. Nitric acid affects the release of the hormones and adrenaline. It is also certain that the product accelerates regeneration of the body and also increases the amount of blood flow, and thus the amount of nutrients delivered to the muscles is much greater. The coffee bean extract, a source of polyphenols. Coffee seeds has chemical composition similar to green tea and grape seed. They neutralize free radicals and intensify burning processes and inhibit the formation of fat in the body, in addition to caffeine contains chlorogenic acid, an antioxidant that is slowing down the absorption of glucose from the gastrointestinal tract. It affects the fat reduction, intensifying the activity in combination with caffeine and EGCG. It is a component of many dietary supplements and slimming preparations improving health prevention. Chlorogenic acid is a polyphenol found in many plants, including in particular the green fruit of the coffee plant, artichoke, nettle and prunes. Different than it is in the case of green coffee beans, roasted coffee beans contain a much smaller amount of the compound, since it is degraded during thermal treatment. This acid is antibacterial, antioxidant, and also a positive effect on glucose metabolism. Reduces the absorption of sugar from the gastrointestinal tract and improves insulin sensitivity. These properties of chlorogenic acid indicates that the compound is used in weight loss, which is also confirmed by a number of clinical trials carried out, showing its efficacy in reducing body mass. It should, however, be emphasized, that accurate analyses also showed that after the withdrawal of chlorogenic acid, they body mass may increase again. Dosage: The recommended daily dose of chlorogenic acid is 800 mg.
L-carnitine tartrate is formed from the combination of L-carnitine tartrate (organic acid) in a single molecule, increasing the interaction (synergism) of each of the substances used. L-carnitine is supplied to the body from the outside through animal food (mutton, beef, venison) or a combination of amino acids (lysine and methionine). It participates in the transport of long-chain fatty acids into the mitochondria of the cell where they are burned. Tartrate reduces the deposition of fatty acids in the cells, thereby enhancing the effects of L-carnitine. It is recommended in endurance sports supplementation, as a dietary supplement for people on a slimming diet and to supplement the shortage of l-carnitine of people not consuming meat products (vegans). Olive leaf extract is produced from the leaves of the olive (Olea Europea) is the source of oleuropein, coumarin derivative, belonging to secoiridoids. It effects: increases thermogenesis, leading to a reduction in body fat, increases the immune system, minimizing the risk of developing heart disease and cancer. It is also supporting the fight against free radicals. Olive leaf extract is a component of weight loss supplements (including thermogenic), antioxidants sets, used in the composition of pre-workout supplements in sports supplementation. Grains of Paradise (Aframomum melegueta) - Melegueta pepper, a perennial plant in the ginger family, Zingiberaceae. It is used as seasoning, although its properties used in supplementation are much more interesting. When it comes to biological activity Aframomum melegueta demonstrates considerable similarity to ginger. It is used as therapy in the treatment of eating disorders, reduces digestive discomfort and supports the functionality of intestines. Aframomum melegueta is also a frequent ingredients of weight loss supplements, due to its ability to increase insulin sensitivity. In this way, it supports proper metabolism of carbohydrates, the disorders of which are a common reason for problems with weight loss. Some sources also say that Aframomum melegueta increases metabolic rate, promoting basic daily energy expenditure of the organism. This plant is also used as aphrodisiac. According to some sources it may increase the level of testosterone, although current studies do not confirm this scope of effectiveness of Aframomum melegueta.